Welcome to our Client Testimonials Page – Here you will find all the reviews and comments our Clients have left for us. The massage that you gave Me recently, was without any doubt the BEST massage I have ever had. i look forward to the next one . a quick note to say thanks for Your good work on Fri. My body is feeling much better since the massage. I am most impressed with The excellent treatment that You provided. You are a caring, kind, and. Such a professional Lady in the way that You treated Me, as I felt so at ease and relaxed from the start. I can see Your Business being a great success. Thank you so, so, so very much Barb. I couldn't be happier with the results. Amazing massage leaving you feeling great and relaxed! Barbara is not just a masseuse but brilliant therapist, one of the best therapeutic healers that you will ever visit. I always come out feeling invigorated and 'light' from the loss of tension from my body. She definitely knows what she is doing. Barbara you have a beautiful soul and I can't wait for my next visit. Barbara is one of the very best masseurs / body workers I have ever been to, she is careful about assessing your individual needs, and very knowledgeable about the body and the different techniques of dealing with various tensions and conditions, I would highly recommend her to anyone looking for an excellent masseur / body worker. I have had many a remedial massage. I really enjoy them and know the benefits. This is one of the first times I gained more benefit without excessive painful massaging. Can absolutely recommend Barbara Forbes. Fantastic technique and skill set. Awesome session this morning with Barbara - one of the best massages I’ve had in a long time! Fantastic! Best massage I've had, best result from massage I've had. 30 years of stiffness and pain from a car accident that gave me double whiplash. Barb was able to help me by releasing the muscles and advise me on how to manage with some effective exercises at home too. Barb is an incredible therapist and puts a huge amount of pride in tailoring her various specialities to suit your issues. 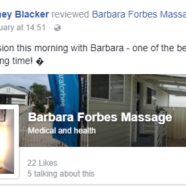 Barb helped with various long-term issues and made a massive difference in helping me identify how to effectively reduce pain by strengthening and treating other areas I didn’t even realise were an issue! Thank you for our wonderful massage. best one ever!!! Worth the trip from Adelaide. I was having a lot of pain in my lower back. My wife nagged me to go to Barbara and thank God I did now. Pain all gone after two visits. I will be going back whenever I need to, for sure. I heard about Barbara from a friend. This friend of mine came away feeling a new woman and now sees Barbara regularly. So, I went to Barbara Forbes to see if she could treat an on-going physical problem I have, due to stress issues in my life. Honestly, I cried during the massage. I felt so released and “floaty”. I will now be attending regularly also, and I travel from the Adelaide Hills to do so. Worth every kilometre!